Sewer Lines - Lake Washington Building Inspection - Serving the greater Seattle, WA and Bellevue, WA areas. 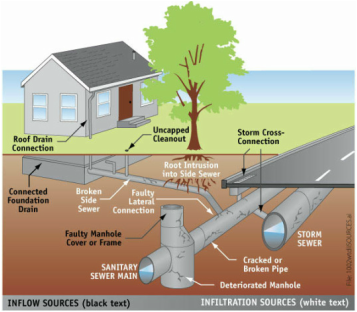 In many areas of Western Washington, the homeowner is responsible for the side sewer line on their property, which connects the house to the city main in the street. These can be upwards of 10' deep and will pass under other utilities, sidewalks, curbs, and the street. If there is damage to the line, repair costs can be costly. Clay and concrete lines are common, and are susceptible to tree root intrusion, becoming offset at a joint, low spots (a.k.a. sag or belly), or cracking and breaking. All of these condition can cause decreased flow, backups, and complete blockage of the line. A﻿﻿ ﻿sewer scope is recommended on many older homes, as illustrated by this video created by the Seattle Channel. Information can be found in the city records of where your sewer line is located, if it is shared with a neighbor, and if any repairs have been performed in the past. Seattle has their records online, but you will need to contact your utility directly in other areas.